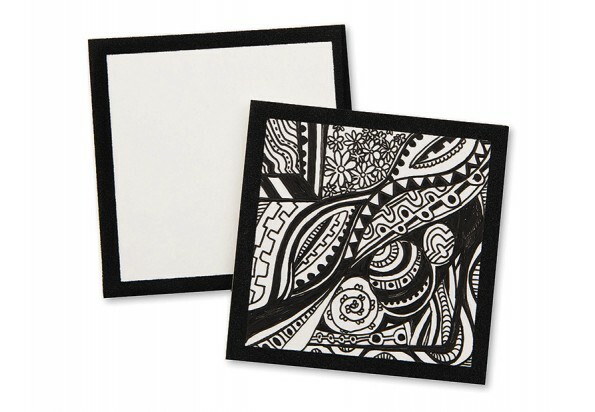 Zendoodle&trade; Velvet Art 4" Blank Squares (PS1386)-Paper items-台州山水工艺有限公司官网,山水工艺,台州山水工艺,仙居山水,台州山水,Taizhou Mountain & River Art and Crafts Co.Ltd,Registered and established in 2006, Taizhou Mountain and River Crafts Co., Ltd is a storage trading company, also is the only one Sino-U.S. joint venture in Xianju County, which was jointly set up by the U.S.-based S&S Worldwide and Xianju Yikai Crafts Co., Ltd. Create your own peaceful patterns on heavy cardstock squares printed with a bold black velvet flocked border and block pattern. Unique pattern is reminiscent of a classic "granny square" quilt or modern tessellation design. Works well with an array of drawing supplies. Doodling is a relaxing pastime that helps with focus. Perfect for individual or community group craft projects all ages will love.